Lady Flower Gardens is a Part 9 Corporation (Alberta) registered Not-For-Profit. We are located on a 5-acre community development garden and we have shared access to a 75-acre old growth forest along the North Saskatchewan River, as well as a 90-person insulated yurt, which is used for community development events. From year to year, Lady Flower Gardens (LFG) develops unique land use agreements with different member agencies. We are deliberate in partnering with agencies that support mental health and wellness with disadvantaged Edmontonians through access to wilderness and agricultural lands. The land use agreements are as diverse as the member agencies. However, all the agreements include various land based activities that full-fill at least one of the following objectives for LFG members who are at risk of being marginalized. 1) Experiential learning i.e. - learning about the different fauna and flora in the forest while actually in the forest. 3) Collaboration- i.e. resources from more than one organization are integrated (the product goes to a collective kitchen for LFG members). ​These three objectives (experiential learning, community building and collaboration) can be incorporated into a number of different land based activities - horticultural, recreational, environmental, religious, culinary etc. The land use agreements are contingent upon whatever the unique member agencies negotiate, and what resources and supports they can integrate with us and other member agencies. When people come to the 5 acre garden, they normally do three things: weed, harvest for Edmonton's Food Bank, and harvest for themselves. Weeding is an essential garden activity, and by weeding first, people are given the opportunity to give back to the garden and take care of it so it can continue producing fresh, delicious, and healthy local vegetables. Harvesting for Edmonton's Food Bank is also important for a number of reasons. On average, our gardeners pick over 50,000 lbs of veggies per season for Edmonton’s Food Bank and over 20,000 lbs for themselves and their agencies. 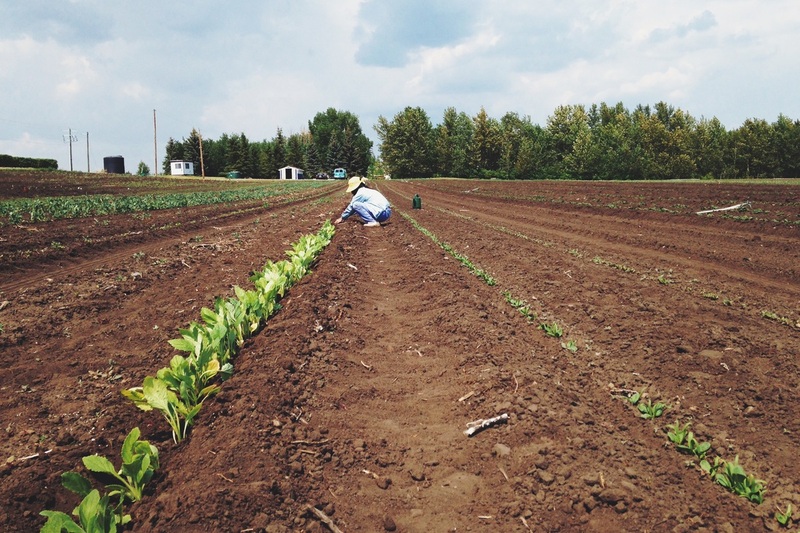 Harvesting for Edmonton's Food Bank empowers our gardeners to give back to the community. By including this in our daily activities, Lady Flower Gardens seeks to foster an ethic of altruism, which contributes positively to people's mental health. The final step in the process - harvesting food for themselves - helps further our mission of learning to live sustainably with the land and each other.